This week, the already-awesome Dufferin Grove Park is absolutely ablaze with awesomeness, with tendrils of wicked cool billowing through its leafy canopies and filling the lungs and hearts of theatre aficionados everywhere. The Cooking Fire Theatre Festival, which runs from June 20-24, is a presentation of five short plays, accompanied by a spectacular organic meal and infused with a spirit of collaboration and comraderie from start to finish. This is not your ordinary trip to the theatre. Leashed dogs are welcome, seating is cross-legged on the floor (unless you can nab a bench) and the ushers are on stilts, holding tiny umbrellas or walking puppet poodles. The whole evening is pay-what-you-can, and the meal is reasonably priced at six bucks an entree. The lineup is diverse and hearty, featuring talent from Toronto as well as from Halifax, Washington, and Chicago. Golgi Apparatus kicks off the evening with Bigfoot: a story of three explorers in pursuit of the reward money promised to anyone who can get a photo of the elusive big hairy beast. Though probably the most kid-oriented play of the evening, “Bigfoot” uses the best bits of clowning to tell its’ tumultuous tale and leaves the big red noses and curly, multicoloured wigs at home. If you’ve ever wanted to see a Shakespeare play done by one woman playing all the characters with the help of a toilet brush and creamers, then Lear’s Shadow, performed by Kiersten Tough of The Spee Society, is likely your cup of absurdi-tea. Tough switches between conversational storytelling and classical text as seamlessly as a sock, and incorporates her surroundings into her performance very well, which can be hard to do when there’s a children’s soccer practice behind you instead of a set. Geared towards folks familiar with theatre history, The Morbid Stranger by Les Trouvères is inspired by the adventures of the Victorian theatre company of the same name in 19th century Europe. The performers stayed in character throughout dinner and dessert, and acted as ushers and MCs for the other plays in addition to presenting their own. A highlight of the evening was Robber’s Daughters, written by Anna Chatterton and Evalyn Perry of Independent Auntie. This is the story of two rival bands of robbers who are forced to coexist in Dufferin Grove Park after one band is driven out of Dufferin Mall by Security. 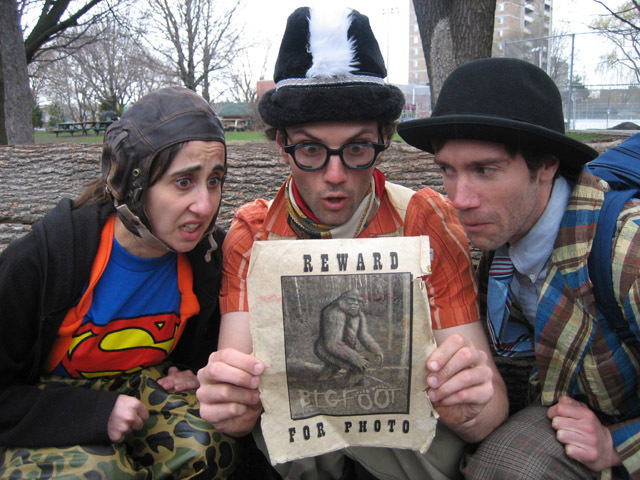 The production’s subtle satire nibbles at the fabric of life in the Dufferin Grove community rather than tearing holes in it, and the results are hilarious. It also has puppets, which are an even mixture of adorable and terrifying. The stunning How To Tie A Knot by Rain Machine concluded the evening. A creation story, spoken word performance, and puppet show, this luscious hodgepodge was more a feast for the senses than a tightly-plotted tale. Lit by torches and accompanied by various plucky, rattling instruments, a witch and an eggpod did odd and beautiful things for fifteen minutes and it was delightful; the cherry on top of an ice cream sundae of a festival.